There's not too much information available on the internet or elsewhere on Opera IX, so could you give us a history? OPERA IX born in 1988 from the perverse mind of Ossian, but it is only in 1990 that the 1st demo tape "Gothik" is realized. After different line-up changes, the band reaches a steady configuration with Cadaveria (vocals), Ossian (guitars), Vlad (bass), Flegias (drums). 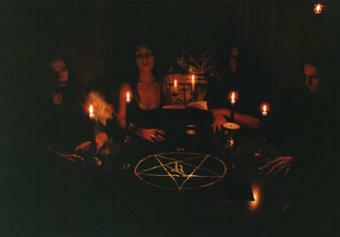 With them, the sound changes from an "occult metal" to an atmospheric mix of doom, death, black. The 2nd demo tape "Demo ' 92", containing four cult songs, allows the band's name to be known in the entire underground scene and leads OPERA IX to a contract with the Dutch label Wimp Rcs. from which in 1993 the 7"EP is produced and outprinted. The first 500 printed copies are sold out in two months only. 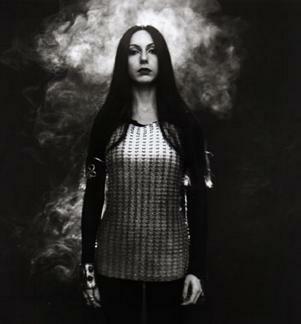 Meanwhile the band realized the video tape "The Triumph of the Death", including two video clips ("The Red Death" and "Born in the Grave"). Its professional quality and the good responses convince the band to include the product in its merchandise, although it was made for promotional use only. In late 1993 Silent Bard, a classical musician, completes the line-up. With his keyboards the band explores those new atmospheres, more ethereal and disquieting, presents in "The Call of the Wood". It is a full album on CD, outprinted in 1995 for Miscarriage Rcs. : about 60 minutes of obscure emotions to fly into the darkest dimensions of human existence; five long songs under the sign of purest Darkness. After the CD was out, the band changes its keyboardsman. The new member Triskent celebrates the traditions of the old pagan religion through his keyboards and guitar synth. Opera IX is on "Awakening" compilation CD - Dwell Records. The band appear with the unreleased song "My Devotion" (for info contact Dwell Rcs - P.O. BOX 39439 - Los Angeles, California, 90039). A new long sleeve shirt ("Ishtar") is ready. It replaces "Al Azif" l-s shirt and the t-shirt, both sold out. Colored print frontal (cover of the new coming album), back and on the sleeves. The cooperation with the American Label Dwell Records is continuing: " A Call to Irons" , tribute to Iron Maiden, is out now. The cover played by Opera IX is 'Rime of the ancient mariner'. Among the other bands, Vital Remains and Absu. April 1998: The 2nd album "Sacro Culto" is out on Shiver Records (info & distro: SHIVER RECORDS/HANS DE WYNGAERT - BOSSEPLEINSTRAAT 6 - 3128 BAAL / BELGIUM - TEL&FAX + 32 16 534943). The new tracks (six, for a total time of 70 minutes!) are more epic and black and the sound is a bit less contemplative. Devastating guitar riffs and symphonic atmospheres are refined by the wicked presence of Cadaveria's (sometimes melodic) voice, while the keyboards are now played by Lunaris who has greatly replaced the other keyboardsman sent away for ideological incomprehensions. A better sound production then "The Call of the Wood" and the wrapping, digipack, will finally convince you to buy this new jewel of extreme music. The song "Fronds of the Ancient Walnut"(from "Sacro Culto" CD) is now a professional videoclip. It is available on "Live at Babylonia" Videotape featuring the clip + 4 new live songs: the magic atmosphere of Opera IX music perfectly recreated on stage! Your new release, 'Sacro Culto,' shows a new development of your voice. You use a more feminine style accompanied by your old style. How did this change come about? Was it a personal one for you, or, was it a band decision? What motivated it? I think it is due to a natural evolution of me as an artist who tries to improve herself. I always try to sing in order to penetrate the lyric, the meaning and the different atmospheres of the song. I thought a melodic voice was the best way to celebrate the astral energy of a song like The Naked and the Dance, or the beginning of My Devotion, that is a very introspective and personal track that needed something different from my usual style to be completely realized. There's a perfect feeling among Opera IX members, so this choice has been welcome by all the band. It was a long period of "silence", but I assure you we never stopped working: first we made an Italian tour to promote "The Call...", then we entered studios to record a promo in order to find a new label for Sacro Culto. Then we changed our keyboardsman, so we had to revise all the songs with him, finally we entered studios again, 1st to record the songs "My Devotion" and "Rime of the Ancient Mariner" for "Awakening" comp CD and for "A Call to Irons", a tribute to Iron Maiden on CD (both for the American Dwell Records) then for Sacro Culto. At the same time we realeased a new videoclip of the song "Fronds of the Ancient Walnut". Once again, the cover art of 'Sacro Culto' is very unique, just like that of 'The Call of the Wood.' Who is it that came up with these concepts and what do they symbolize to you? The cover of "The Call..." was our personal interpretation of the horned king, half beast and half human, the one who rules the wood and guides natural spirits. The cover of "Sacro Culto" represents the goddess Ishtar. She is naked 'cause Ishtar is symbol of Truth and truth doesn't need veils. In the right hand Ishtar offers the cup, symbol of vital procreation, in the left hand she brings the lotus, a flower thats born in the dark underwater abyss but that becomes pure when it emerges to the light. Summarizing : ex tenebris ad lucem (there is more light in darkness than light in light !). Nothing to do with the use of female body for advertising! In between your two releases, to our knowledge, you have appeared on two cd's, 'Awakening-Females in Extreme Music' and 'Tribute to Iron Maiden'. Both of them held a glimpse at your new vocal approach, and a musically richer Opera IX. Explain the motivation of being involved in these two releases. About the 1st (Awakening), we simply liked the idea to appear on a professional comp CD (and not always on those very underground compilation tapes). We were working on Sacro Culto songs and the track "My Devotion" was ready and Dwell Rcs liked it a lot... After Awakening was out we noticed how Dwell Records work, that it is serious and professional. So when it proposed us another co-operation we didn't hesitate. Surely the cover "Rime of the Ancient Mariner" wasn't our fave Iron Maiden song, but there were few songs left to choose... and then this one is very long...in the typical Opera IX style. With the add of keyboards and some changes to the lyric (too much solar for my taste!) we have written another little chapter of Opera IX history. Your lyrics have always dealt with pagan/occultism topics. Is this a religious belief or just an interest? Could you explain your thoughts and feelings on paganism? Opera IX is not only a musical band but also a five elements sect. We love to live in solitude and operate in secret. We cross the occult ways of ancient pagan knowledge through meditations and rites. We honor Celtic gods and the forces of Nature but, above all, we strongly believe in the power of our own minds and spirits. This is our essence and it is hidden in the lyrics and music we write and play. On the topic of religion, Christianity has had a large impact on the old religions, to say lightly. What are your thoughts on Christianity ? Christianity has (tried to) destroy(ed) Celtism. On ancient Celtic temples they have built Christian churches, they have kept Celtic seals and they have transformed them in Christian symbols to adore. Christianity has put the world in slavery! I love freedom, so you can imagine what I think of Christianity. But many people know the truth. Ancient traditions are still alive in me, in my friends and in many people in Europe, most of all in Scotland and Ireland. ( This is why I put "tried" in parenthesis ). In Italy Christianity is something very strong, but I don't feel it as a great problem: I trust me, I go right along my way and I don't care of what people think of me. In contrast, what are your thoughts on Satanism? If I was forced to choose between Christianity and Satanism, obviously I would choose the second one, but to be honest I don't feel Satanism so near myself. I'm attracted by Satan's figure as something strong, powerful and sexually interesting. I 'm used to wear anti-Christian necklaces and rings...I'm free do to this, nobody can tell me anything about what I wear ... but to be Satanist is another thing. I prefer to believe in something more tangible, in the forces that have revealed themselves to me, in those who have called me to them during my dreams, in the energy that is in myself. A lot of the underground music scene, including many of the labels/distros, possess a hatred for Christianity. A lot of bands carry pagan imagery in their lyrics, etc., some say it is a sort of awakening, as a lot of the old bands who once glorified Satan have now found their ancestral deities. What do you think about this? Yes, I have noticed this fact. It is very strange. Isn't it? Alteration of human souls, new devotion or trends? Surely the last one! Surely something that has nothing to do with Opera IX! From the comp. CD 'Females in extreme music' the song 'My Devotion' is very good. It can now be found, although slightly different, on your new release. Explain why you chose to re-do this song? Was this song meant as a sort of preview of what was to come? The reason is less artistic then what you think. The complete version of My Devotion was already done when Awakening was in project, but our song was too long to be put in whole length. So Dwell Records, according to us, decided to cut it. We already knew the entire version would appear on Sacro Culto only. What can we expect from your next release? Do you have any material as of yet? Three new songs are ready now. We are thinking about a 3rd album. It will show 5 or 6 tracks, always very long (some more, some less). Can I say they are great? Surely something anyone has ever listened to. We've always found Opera IX to be a very unique band. Not only because you are a female vocalist singing in a 'black metal style,' but the music itself carries with it a distinct sound. Over the years have you encountered any problems of being accepted since you are a female vocalist? Thank you for all the compliments! Nobody has never come to me and said I am a problem for the band or for black metal scene in general (also 'cause we never defined ourselves as a black metal band), but maybe someone has though . I'm sure this is not a problem for fans: they always cover me with compliments... but maybe it could be a problem for labels (major, I mean). Perhaps they are afraid to invest money in a band that has a frontgirl, I mean a girl who sings and sometimes dresses like a man, not a girl like the one who sings in Theatre of Tragedy, for example. The only girl I can remember who sings "like" me is Sabrina of Holy Moses (great band). Maybe this is the reason why a major label hasn't already contacted us for the 3rd album!?! Here's a question we're sure not just ourselves have wondered. What does the name 'Opera IX' mean ? And why was it chosen ? Yes, it is a very original question! Well, the name OPERA IX mirrors the band's evil soul:'OPERA' must be intended as 'creation', as a ritual to mold and rule the matter, the outcome of a labour, the realization of a thought, of a will and of a way of being...'IX' is a meaningful number (like 3 and 6) and for a long time it has been synonymous of magic: it has the power of 3 times 3, the perfect number, it is the more distant number from 1 (one, that represents God), it is the last solitary number, over it there is nothing, the boundary number over which there is mystery. Being from Italy, how is the metal scene there? Are there any new bands around those parts who deserve a mention? None! But, attention, Necrodeath are coming back! What inspires you in and outside of music? All what we write belongs to us. Our music (and lyrics) born spontaneously from our souls (and minds) and we don't care to belong to any particular genre. Our inspiration is ourselves. What are some of the things that interest you other than music? Hobbies? What do you like to do in your spare time? When I don't play music/don't answer interviews/don't write a new song/don't work, I like to explore the Internet, listening to music. I'm also studying cinema/theatre and ancient music at a university, so, sometimes, I must study. When I have the time I love to walk in the woods with my dog. About other members: well, Flegias realizes movies with his videocamera and drinks beer, Ossian makes Celtic and Satanic jewels by hand (great), Lunaris studies or sleeps (he is the most normal in the band) while the fave game of Vlad is to exhume bones in cemeteries. Have you done any touring or live performances? If so, with who and where? If not, are there any plans for this? Many in Italy, only 2 abroad (France). Shiver records is organizing an European tour for November/December 98. Alas, 95% of the bands we have interviewed have expressed a dark view on the world and its future. They feel, like a lot of others it seems, that things will grow much worse worldwide, before anything improves. Could you tell us your opinion on this? And why you feel this way. Me too. I am a pessimist about the world. All is done for money reasons. Man is destroying the earth. Nature will revenge. Nature will get back its spaces, with fire and water it will sweep men away. I think this will happen in 100 or 150 years. I still have the time to live and to do great things for myself and for my friends and my family.